According to the Department for Transport, the number of children travelling to school by car over the past 20 years has doubled. Whatever way you look at it, that’s a worrying statistic. Prevention is better than cure, so to avoid ballooning numbers of obese children and adults, that trend has to be curbed. And as members of the cycle trade there’s an obvious added incentive for getting kids out of cars on the school run. How many of us spent our childhood on bikes on the way to and from school? 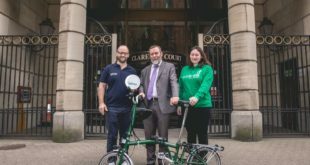 Bike Hub, the cycle industry levy, has for the second year pledged funds to Sustrans’ Big Pedal competition, an inititative tailored to encouraging children to saddle up. The results are now in for the competition, which challenges schools to cycle the most miles in three weeks in March. Did the response from schools to Big Pedal 2012 meet expectations? Absolutely – we were really impressed with the effort schools, pupils and parents put in to this year’s competition. We’ve had so much great feedback from teachers and plenty of stories of mums and dads getting back on to bikes for the first time since they were kids. Was it easier to publicise and get the Big Pedal message across now it’s an established competition? Yes. Having an established competition enabled us to start getting the message out earlier. We had hundreds of schools pre-register for the competition to be the first to hear of dates etc. There’s a real buzz around the competition now, schools just can’t wait to get started. Do you know how many schools returned to take part in the competition again this year? We don’t know the exact numbers but we recognised lots of the schools we had taking part from the previous year. Schools that took part last year were trying to beat their finishing place this year and trying to get ahead of schools they finished behind last year. Is there the potential for the Big Pedal to grow still further in 2013? Definitely! We want to encourage even more schools to get involved next year. We want to give all children the opportunity to be involved and have a chance at cycling to school – the three-week competition is a great way to show them just how easy it is. Last year there was speculation on creating a ‘workplace versus school’ aspect to the challenge. Is that any update on that? We would love to get the bike trade involved in actually taking part in the race – getting the bike shops to take on kids and see how many journeys they can make in the competition. It didn’t happen this year but it’s something that we’d like to look into further. The support from the Bike Hub has been brilliant once again – the race wouldn’t be possible without the funding and support it gives the competition.